Ear barotrauma is discomfort and possible damage in the ear due to pressure differences between the inside and outside of the eardrum. Swallowing or yawning opens the eustachian tube and allows air to flow into or out of the middle ear, keeping the air pressure on both sides of the eardrum equal. 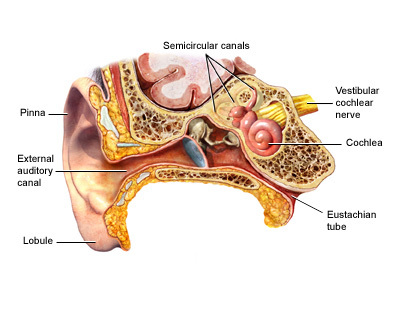 If the eustachian tube is blocked, the air pressure in the middle ear is different than the pressure on the outside of the eardrum. This can cause barotrauma. Blockage of the eustachian tube could also be present before birth (congenital), or it may occur because of swelling in the throat. During an inspection of the ear, the doctor may see a slight outward bulge or inward pull of the eardrum. If the condition is severe, there may be blood or bruising behind the eardrum. Severe barotrauma may be difficult to tell apart from an ear infection. To relieve ear pain or discomfort, first try to open the eustachian tube and relieve the pressure. When flying, do not sleep during the descent. Use these measures frequently to open the eustachian tube. Allow infants and children to nurse or sip a drink during descent. Divers should descend and ascend slowly. Diving while you have allergies or a respiratory infection is dangerous, because barotrauma may be severe. If self-care attempts do not relieve your discomfort within a few hours, or if the barotrauma is severe, you may need medical intervention. These medications may relieve nasal congestion and allow the eustachian tube to open. Antibiotics may prevent ear infection if barotrauma is severe. If the tube will not open with other treatments, surgery may be necessary. A surgical cut is made in the eardrum to allow pressure to become equal and fluid to drain (myringotomy). However, surgery is rarely necessary. If you must make frequent altitude changes or you are susceptible to barotrauma, you may have tubes surgically placed in the eardrum. Barotrauma is usually noncancerous (benign) and responds to self-care. Hearing loss is almost always temporary. You can use nasal decongestants or antihistamines before altitude changes. Try to avoid altitude changes while you have an upper respiratory infection or allergy attack.